A truck is thrown off a bridge in Washington, seemingly by a giant hand. The clipping book sends team Librarians to the scene of the crime to investigate. When the team discovers a giant fingerprint on the window of the truck, Jenkins tells them it may be a troll. They must get a sample or a picture during the daytime when the troll will be subdued. Eve and Ezekiel find a massive "rock" that seems to greatly resemble a troll, so they abscond with some pebbles from the mass. Cassandra is woeful that Jake still doesn't trust her after her initial betrayal to the team, though he claims to be perfectly fine with working under their current circumstances. They are shocked when the local mayor out for a jog is running wearing no clothes, yet under the impression that he is wearing a new jogging suit given to him by his wife. The sheriff shares some other recent strange happenings to Cassandra and Jake who continue to put the pieces together. After reuniting with the rest of the team, they hear chaos caused by a giant wolf wearing a frilly nightcap, which Jake takes down by throwing an axe at it. They realise that fairytales are coming alive and attacking people, meaning someone has weaponised fairytales. The team reconvenes with Jenkins, who sends them back out to make off with the wolf carcass so they can perform an autopsy. Upon cutting the wolf open, they find a shivering and confused young woman. Jenkins determines that there is an old book that brings stories to life as it is read. As the book gains power, those stories can be changes, things can be added, and reality can be re-written. The stories become more powerful, more people and places can be swept up in them, and says that the story need a power source to bring it to life. Somewhere in the local hospital, there will be a pattern of people getting sick for no reason. (This particular brand of magic was also the cause of the Black Plague). Eve and Jake make it down to the library, where the librarian is unknowingly in possession of the enchanted book. Meanwhile, Ezekiel follows an enchanted coin that keeps rolling until it stops in the room of a sick girl, Jamie, whom the local librarian had been reading to earlier. Ezekiel learns that Jamie got sick after falling asleep during story hour at the library. Cassandra is also receiving an increasing amount of attention from the females in the town. Ezekiel has already angered the sheriff with his prior antics, but when he learns that Ezekiel had visited Jamie (his daughter) and had also taught her how to pick locks, he becomes enraged and threatens to huff and puff and blow the bar down. The sheriff starts to sprout fangs and is slowly turning into the big bad wolf. Eve also begins to hum (as well as having her hair down and appear to be particularly shiny and appealing), and Jake randomly has an axe appear in his hand as well as a bird come land in him. Jake is continuing his path into becoming the huntsman, Cassandra is Prince Charming, and Eve is a princess. Jenkins warns them that their being heroes doesn't mean that they're safe, as these are the original stories which are much darker in theme and content. The only person who escapes in every story is "the jack," the nimble rouge/luck thief who lives by his wits. The team looks up and finds that Ezekiel is gone and the rest of the townspeople have all begun to turn into various fairytale characters. The book is getting stronger and the danger is growing. The team decides to try to get all of the townspeople, minus the wolves, back out into the library since they can't leave town the normal way because thorny branches have risen up out of the ground to block them from doing so. Ezekiel returns to the hospital where the librarian is reading to Jamie and making her sick. Ezekiel tries to stop him but is unable to do so, as the librarian has been corrupted by the book's power. He had already discovered that reading from the book caused the listener to be drained of their life force and thereby strengthen the reader. Eve calls Ezekiel and they swap information. Ezekiel must get the librarian to stop reading or everyone in the town will be slaughtered. A fight breaks out in the library as the team begins fighting the wolves. Ezekiel uses the luck he has by tossing the coin he had previously given to Jamie, which goes bouncing through the room, freezing the librarian in his place, and allowing Ezekiel to steal the book back and regain some power with a temporary spell. He gets Jamie to wake and has her tell the story she wants, with her happy ending. Jamie says that the team didn't really die like the corrupt-librarian said because the huntsman (Jake) is actually a robot, the princess (Eve) is a ninja princess, and the prince (Cassandra) is really Merlin (an immortal wizard). Using their combined skills, they chased the wolves away. Jamie punishes her father by making him eat green jello, declares this the end, and the evil librarian is sucked into the book as the story finishes. 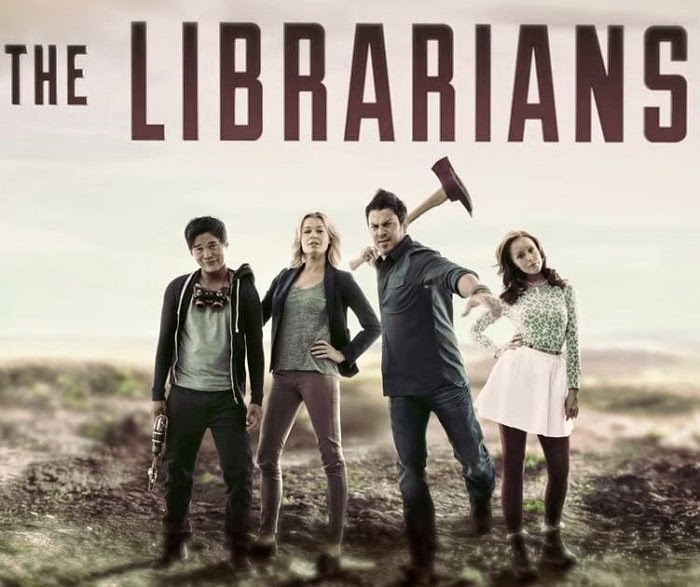 Team Librarians covers their track with a claim about chemicals and mass hallucinations, Jamie's health is restored and she is reunited with her father, who is willing to overlook things now that his daughter is better, though he finds that in hindsight it doesn't make much sense for a team of librarians to have helped them so extensively. Jenkins also collects up all the old books the librarian had. The book that had caused all the trouble is blank, save for just one page that has an illustration of the evil librarian. The rest of the team ponders how they experienced their alter-egos, and Ezekiel simply notes that he is awesome since the book had turned everyone into heroes whereas Ezekiel basically remained the same person. True that, Ezekiel.